Happy Thursday! I've been feeling very inspired lately to put as many outfits together as possible. Not too sure if it has something to do with me feeling like I fell behind with my blogging or just because I want to work harder at my passion. Either way, it's a win win for me! I'm challenging myself to dig deep in my closet and pair new outfits together with clothes that I've had for awhile- so far so good. It was a rainy weekend here in SoCal so I was trying to keep warm without looking like a slob. I thought, I haven't worn a skirt in awhile so why not try it out? To avoid looking like I'm dressed for the wrong season, I definitely made this outfit rainy day friendly. I went with a sweater and I'm glad I did because I felt like it helped the skirt stand out. To avoid getting my skirt wet, I threw on my high heeled booties; black of course. For a little something extra, I dressed up the neckline with a black statement necklace. Happy Tuesday! How are you doing this fine day? The weather has done a complete 180 over here and now it's all gray skies and rainy days. Of course, I'm not complaining because I love me some rain every once and a while. I decided to match my outfit with the weather. I pulled out an oldie but goodie sweater shirt from Forever 21 that I got years ago. It was a statement especially with the black cross on it. I wanted to show off my silver Forever 21 flats so I thought it was perfect to go for a one color, color palette. To avoid being all 50 shades of gray, I topped the outfit off with a blue tone cardigan. Happy Monday! I hope you all are starting your week off right! I've never actually dreaded Mondays until I started working full time. Even though I wish I could stay at home and relax, I know that someday I will be able to do what I love and not have to call it work. Which is exactly what this #MotivationMonday is all about! I know that sometimes we aren't always happy with where we are in life. And although it might seem like the easiest thing to do, complaining about it isn't the answer. You see, I've learned that the more I complain about what I have because I don't have what I want, the more I attract that. I am keeping myself from emitting the vibe of achieving my dreams and goals. Sure, there are things that we wish we can change but we forget that it's the journey of learning, living, and loving in which gets us to where we want to be. Being grateful for what you have now is what is going to get you on the right path to your fullness. It also takes a lot of work and sacrifice but if you love it that much, you'll do anything for it! 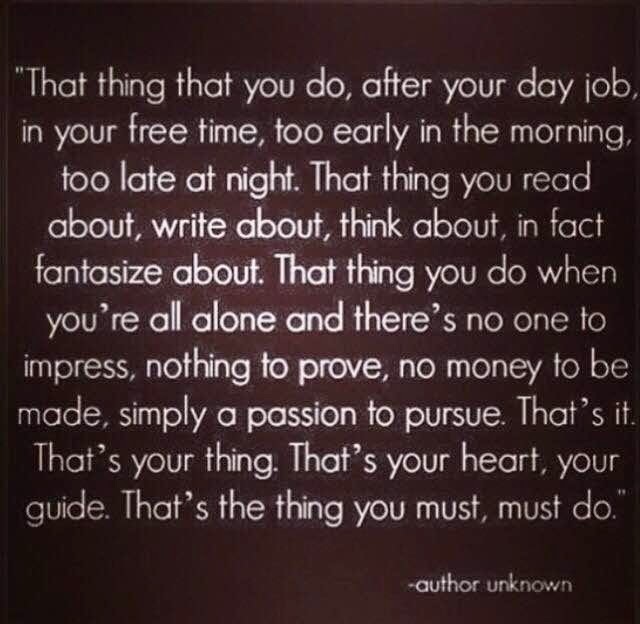 The easiest way to found out what your passion is, is to see what it is you do on your free time. What you long for when you get off work, what you crave. THAT IS YOUR CALLING, YOUR PASSION. That is when you know that you have something. Once you realize that, in order to be happy, you've got to pursue it. So who cares if people think it's odd? Who cares if it's not the norm? Do it anyway! That is exactly what's going to make you, YOU. It takes a lot of patience and perseverance. But once you pass through it all, that's how you know that you earned it! So don't let your Monday blues get in the way, work towards your dream! So that you can live the way you want to in the future. Whatever it is that you are, BE A GOOD ONE. Happy Thursday! I don't know about you but over here on the West Coast it seems as though Winter came and went. It's been pretty sunny and warm! Of course I'm not complaining but would be nice to dress with a little more layers. I have to make the best of it thought, so here I am embracing the sun's rays and all. This look is a fav of mine because it's so simple but with addition of the hat, necklace, and boots it looks so stylish. Another one of my "boho vibes" outfits! I just recently bought this shirt from Target and I like that it had slits on the sides but nothing too drastic. I had been wanting to wear this long line necklace for the longest so this was the perfect time. I tried a different hairstyle for the hat and I love that it's a time safer but still different yet cute.